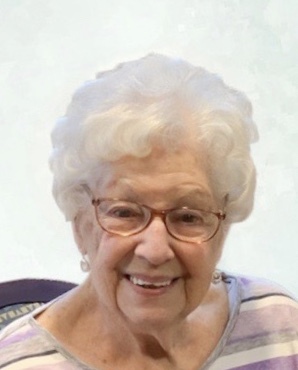 Joan Bell, 91, of Terre Haute, passed away in Brownstown, IN, surrounded by family. She was born to Earl and Doris Swaggerty. Married to George Alan Bell. Joan was preceded in death by her parents; her husband, George, and a grandson, Wade Driggers. She is survived by four daughters: Linda Bell, Brazil, IN; Priscilla Driggers (Lloyd), Terre Haute, IN; Nancy Patrick (Rick) Seymour, IN and Doris Fisher (Monte) Riley, IN; eight grandchildren: Rikki McGuire (Pat) Sellersburg, IN; Derek Patrick (Natalie Bridger) Fishers, IN; Dustin Patrick (Kaci) Camp Lejeune, SC; Whitney Taskey (Brandon) Seymour, IN; Darin Patrick (Caitlyn) St. Augustine, FL; Stephanie Driggers, Terre Haute, IN; Danielle Revere (Jason) Terre Haute, IN; Joni Tichy (Bob) Austin, TX; George Fisher (Megan) Terre Haute, IN; and 18 great grandchildren.